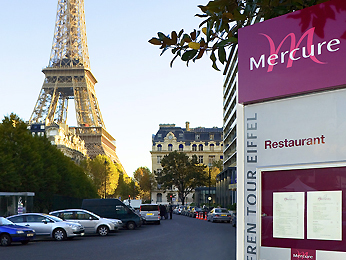 Close to the Eiffel Tower and Trocadéro, the Mercure Paris Centre Tour Eiffel is a 4-star hotel just waiting to be discovered in the heart of Paris. An ideal starting point for your visit, you will appreciate the proximity to public transport and our tips for visiting this beautiful city. If you need a setting that combines pleasure and work on a business trip, discover our meeting rooms and relax in our fitness room with a view of the Eiffel Tower or on the restaurant terrace.